We have a 9 year old daughter named Marissa and a 11 year old son , Alex who absolutely adore being in Florida - especially if they are in the pool! They have been visiting since they were weeks old, so when we say that we offer free baby facilities it is with the knowledge of what parents actually need and we would use ourselves. All our villas have stair-gates (including the single level because you can use them for doorways too! 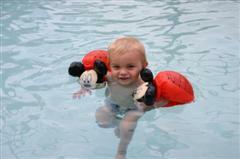 ), babybaths, monitors, high-chairs, strollers, pack n play cots and a selection of baby friendly toys. We do recommend bringing your own sheets for the cots though as every baby has different sensitivity to fabrics and soap powder. Younger children will love the themed rooms especially the 'Disney' ones. Most of our guests come to Florida with one thing in mind and that is the Parks - so this makes it a little more special for them. We provide a range of toys including dolls and toy cars to play with and also a Radio Flyer Wagon at Sunshine Villa which our son loves (image for illustration only - child not included!!!!) 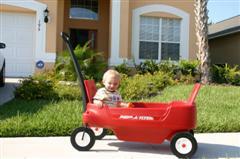 In fact this has proved so popular we added one of these to the other villas too (a wagon that is, not a child!). For older kids we have TV's and DVD players in all bedrooms so they can get their own space if they want! And in the villa we have the usual suspects like a DVD player, Playstation 2 and a selection of games and films to use. The pool of course is great and we supply a few inflatables and the games room keeps most occupied for hours with the billiard table, and foosball etc. You don't need to be a teenager to use a Playstation (although I think it would help me a little with the games if I still was!) and of course the billiards table and other games room facilities are great. Most of our guests are families (often extended families) and it is great to be able to do family things - so we have provided a selection of board games as well as films that will suit the whole family. Having gated resort communities is a real plus for children - it means there is increased safety and security and they can use the resort facilities such as the resort pools, play areas, games rooms, arcades etc too. It gives them a chance to meet new friends and interact with other children to make their time in Florida more special. As I have just mentioned the resorts are gated communities with security/cctv access points. The villa is also designed to maximize children's safety, in particular with regards the pool area. All our pools are surrounded by a lanai or 'pool cage' - a large tight netting that encloses the whole pool to keep insects etc out. They also all have safety fences that prevent direct access from the villa to the pool and comply the Florida pool safety requirements. The doors to the pool are fitted with 'buzzers' too so you can tell if a door is opened. Of course the responsibility with safe use of the pool rests with guests, but these items when used correctly should ensure your peace of mind.